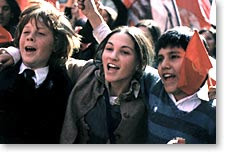 Winner of numerous Best Picture and Audience Awards throughout Latin America, Chilean director Andres Wood’s moving film about two boys who become unlikely friends during the heated political events and civil war that erupted in 1973 marks yet another fine film about coming of age in a foreign country. The official selection for Chile’s entry as Best Foreign Film to our Academy Awards, Wood proves to be a wonderful and adept director capable of eliciting mature portrayals from his young cast. When eleven-year-old Pedro Machuca (Ariel Mateluna) is given a scholarship to go to a private parochial school from ambitious Priest Father MacEnroe, he endures cruel jests from his wealthier classmates who have inherited their prejudices from elitist parents who look down on his humble shantytown background. However, sensing a new ally, the wealthy Gonzalo (Marias Quer) quickly befriends Pedro but as the country begins to politically implode-- escalating into the uprising that would leave Allende dead-- class wars ensure and thereby affect the nature of their friendship. There has been a recent influx of extraordinary and sometimes neorealist inspired films from Latin America about boys growing older and like the most beloved foreign film that dealt with this subject—Truffaut’s French film 400 Blows—it's evident the depth of compassion and tenderness that director Wood had for this story and the young people in the film.